Florence Indolfi was born in Caulonia, Calabria, Italy. For many years she and her husband (Ralph) owned and managed the George Street Cleaners in downtown Cumberland. As the 1973 photograph above depicts, the business was located directly across the street from the Ramada (former Holiday Inn.) The Center City Parking Garage now stands on the site of the former cleaning operation. The Cumberland City Directory from 1956 identifies the address as 101 South George Street, and Florence Indolfi as the firm's Secretary-Treasurer. 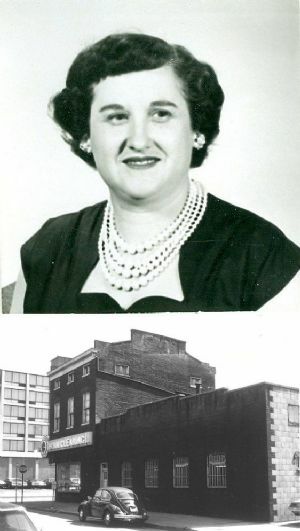 Prior to her retirement and relocating to Frederick, Florence had been a member of Saint Mary's Catholic Church in South Cumberland and was a member of the Anita Garibaldi Italian Club*. South Cumberland was a destination point for many Italian families immigrating to America in the early part of the Twentieth Century. Florence enjoyed crocheting and loved to cook. * Anita Garibaldi (1821-1849) was the wife of Giuseppe Garibaldi (1807-1882), an Italian revolutionary and nationalist who is considered one of the "fathers" of modern Italy. Anita is widely regarded as Giuseppe's partner and comrade-in-arms as well as his wife.